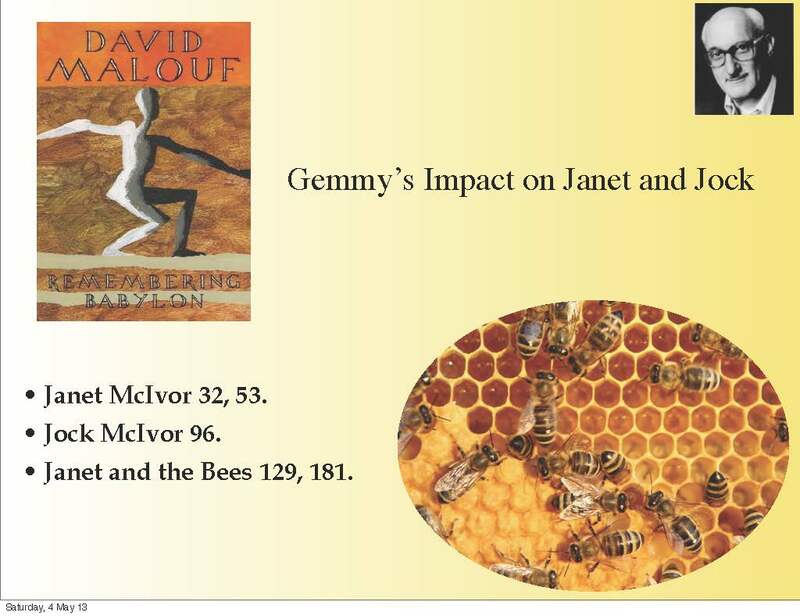 At Mission Australia, Surry Hills we are getting ready for David Malouf’s visit to our class to talk about his amazing novel Remembering Babylon. This is a novel which expresses the importance to our society, of those people who society usually dismisses as having no worth. Gemmy is such a person. Treated badly as a child in England he finds his way, miraculously (after a shipwreck) into an Aboriginal community in Australia, where he grows up. In his teenage years he feels the yearning to make a reconnection with his “mother” culture and finds his way to a small Queensland, coastal township. Here reactions to him are mixed. Children are drawn to him, so are their families. They find something amazing about his way of Being. But the majority of the townsfolk are afraid of him, want nothing to do with him, even want to kill him! So the story unfolds. And the story begins with this extraordinary quotation from the English radical poet William Blake “Whether this is Jerusalem or Babylon we know not” (Blake, The Four Zoas). Through this quote is Malouf implicitly asking whether Australia is ready to be open-hearted to the outsider? Is this country, potentially, a new Jerusalem where harmony might be the dominant tone? Or is Australia a modern version of Babylon, where the clash of voices, the intolerance will persist. This amazing novel explores this question. Blog questions for those studying this novel can be drawn from the image at the bottom of this blog: chose one character and describe Gemmy’s impact on this character. For all you budding Blogging Writers, this will be an absolutely fabulous opportunity to learn, first hand, something about the craft of writing from one of the world’s famous modern authors. ← Week 8 (on campus) Blog Topics. Gemmy’s impact on Jock McIvor is profound but curiously indirect. It is not something he did because Lachlan and the girls brought Gemmy back as a new plaything. It is their mother who persuades Jock who agrees almost against his better judgement. The fact that ever since coming to Queensland life had been hard for the McIvors. Firstly they worked on the big holding as the married couple on a big holding on the Darling Downs; living through the hot summers and Jock having the sunniness burnt out of him by bushfires. When land is thrown open on the Burdekin they moved on to their own property he continues to see himself as no different to his mates. But Jock is stern and hard to live with. He stops seeing the beauty and miraculous in nature That is until his wife takes in Gemmy. It is only when he sees how the decision is affecting his mates and neighbours. The recognition of the suspicion and absence of generosity to the outsider makes him recognize that he is different from the others in the settlement. Is this a sign of marurity or a breakdown?